This a new installment in our series dedicated to great souvenirs from all around Japan. This time we will be introducing delicious souvenirs from Hokkaido in two parts. For our souvenir collection, today we will be focusing on Hokkaido. Hokkaido is a large region with a prospering farming industry. The region is well known for its delicious fresh produce and dairy products. Many souvenirs from Hokkaido make the best of those specialty products. We will introduce our selection of sweet souvenirs from Hokkaido. Royce' Potatochip Chocolate ORIGINAL is a potato chip snack coated with smooth chocolate on both sides. Does that sound like a strange match to you? Well, take our word for it and try them out. They actually go very well together. Once it's in your mouth, the chocolate flavor spreads out. The slight saltiness of the potato chip doesn't get in the way of the chocolate, but rather it brings out the sweetness of the chocolate. The aftertaste is mostly potato chip saltiness, and is quite refreshing. Other than the chocolate-coated ORIGINAL flavor, they also offer bitter cacao-flavored MILD BITTER, a white chocolate covered FROMAGE BLANC, and CARAMEL. Manufacturer: ROYCE' Confect Co., Ltd. This one is also a Royce' product. It's "raw chocolate" (or 'nama chocolate' - a mixture of chocolate and fresh cream), using fresh cream produced in Hokkaido. The difference between this raw chocolate and others is how it melts in your mouth. The pleasant taste of the fresh cream and milk-flavored chocolate easily melts inside your mouth. Western liquors are used for flavoring, creating an even smoother taste. The cocoa powder sprinkled on top adds to the refined flavor. As a lot of fresh cream is used in this product, it should be kept at under 10 degrees Celsius. Remember to keep it in the fridge. Other than the most popular variety, AU LAIT, they have the standard MATCHA, WHITE, CHAMPAGNE, BITTER, and MILD CACAO, as well as seasonal flavors. It might take you a while to choose which one you want the most. Along with the Potatochip Chocolate above, Nama Chocolate can be purchased at department stores like Marui-Imai in Sapporo. The Marusei Butter Sand (sandwich) of made by Rokkatei is a crispy biscuit snack with white chocolate, raisins, and cream made with 100% Hokkaido raw milk-made butter, sandwiched inside. The retro packaging is cute too. The texture of the biscuit and the smooth and rich sweetness of the cream, and, to top it all off, the sourness of the raisins are an incredible match. The raisins are large, and let out just enough juice when you bite into them. The flavor is rich, but it won't have you getting tired of it anytime soon. They offer various size packages, from 4 pieces to 30, so you can get some of these if you're planning on handing out souvenirs to all your friends. You can buy even just one for yourself to enjoy at the shops. Manufacturer: ROKKATEI CONFECTIONARY Co., Ltd.
Yukiyakonko is a black cocoa cookie covered in white chocolate. It's even more delicious when eaten after being cooled in the refrigerator. It's chocolate, but it has a refreshing taste. The secret to that is the lemon powder and orange peels inside the chocolate, making a great refreshing snack. The Yukiyakonko is also a Rokkatei brand souvenir, so the butter taste is perfect as well. In addition to the main store in Sapporo, Rokkatei has shops throughout Hokkaido, for example in regions like Obihiro as well. 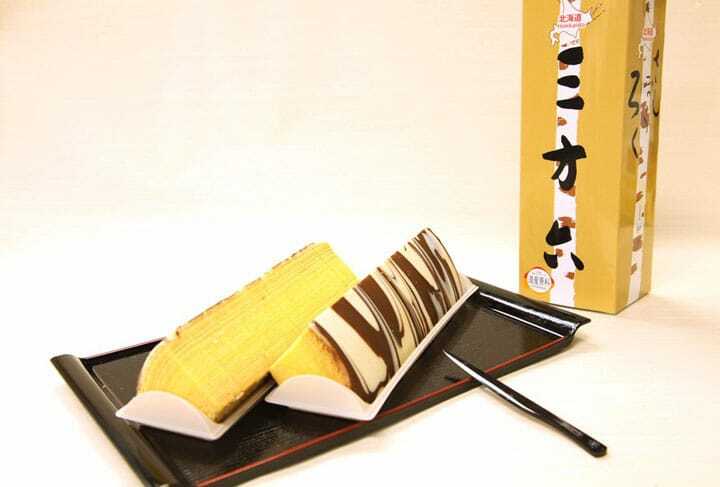 Sanporoku is a baumkuchen made from milk chocolate and white chocolate, representing white birch bark. The snack uses flour from Tokachi, as well as butter, sugar, and eggs all from Hokkaido. The layers are like tree rings, and the snack really looks like you just cut into a tree. The chocolate coating on the outside is crispy, and the sponge on the inside is sweet and moist. You can enjoy the two textures together. Other than the normal PLAIN flavor, which brings out the best of Hokkaido ingredients, they offer a maple syrup kneaded MAPLE flavor, and cacao CHOCOLA flavor. Other than at the Sweetpia Garden in the Tokachi region, Yukiyakonko can be found at the Odori Main Store at Obihiro station, as well as throughout Hokkaido at stores like AEON Obihiro. What do you think about our selection? There are so many souvenirs to choose from in Hokkaido, so we'll continue our presentation of these amazing treats in Part 2! Japanese Sweets Exclusive To Tokyo Station? 5 Fun Tokyo Souvenirs! Souvenirs From Hiroshima – 6 Delicious Sweets That Make Great Gifts! Nijo Market in Sapporo - Hokkaido's Delicious Foods in One Place!